When I checked the date this morning I realised it’s exactly 25 years since a day I’ll always look back on fondly. 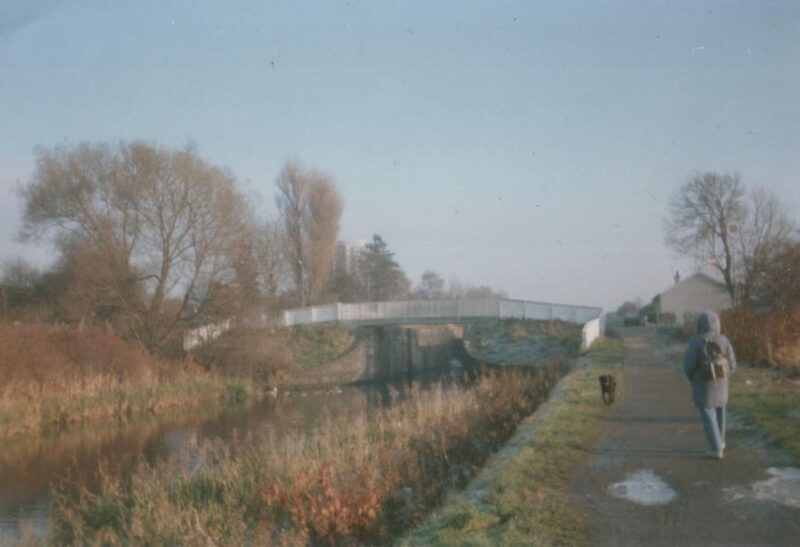 On Saturday 20th November 1993, I walked from Bowling to Glasgow along the Forth and Clyde Canal with my uncle and auntie, Ian and Chris. It was part of my 14th birthday present from them. I could also have chosen a geological expedition in the Pentlands, a meal out, or suggested something myself, all of which would have been fun, but it didn’t take me long to decide on the canal walk. 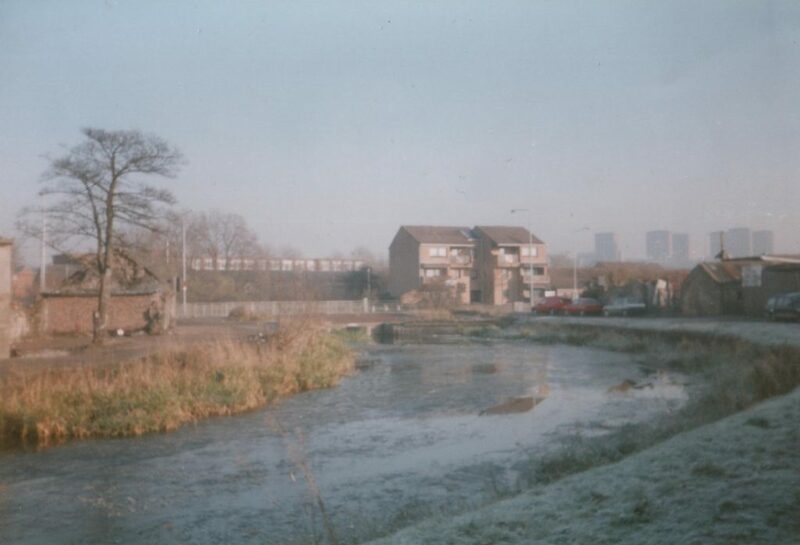 (I’ll just acknowledge right now that walking 12 miles along a derelict canal in the freezing cold wouldn’t have been most 14 year olds’ idea of fun, and also that most 39 year olds probably wouldn’t remember the exact date of said walk 25 years later. But then as you probably already know if you’re reading this blog, I’m not most people). As soon as we’d arranged to do the walk, I couldn’t wait for the day to arrive. My mum and brother and I (well, mostly my mum and I, I think my brother was just dragged unwillingly along) had been walking the Union Canal in stages of a mile or two for a few years and had completed most of it by that time. I think we’d done all the way from Edinburgh to about Polmont and probably would have already finished the whole thing if I hadn’t broken my arm falling over a fence a few weeks earlier. I always enjoyed exploring each new section, seeing what it would be like… the forgotten mossy bridges, the overgrown reed-filled basins, the silted up culverts. But this walk was going to be even better. For a start, we were walking a full 12 miles, further than I’d ever walked in one go before, and that meant a whole 12 miles of canal to explore rather than the usual one or two! Secondly, I barely knew the Forth and Clyde Canal at all so it would all be completely new to me. Thirdly, going right over to the other side of the country, especially to Glasgow, felt very adventurous to me back then. And fourthly, I always enjoyed spending time with Ian and Chris no matter what we were doing. I’d got a new camera for my birthday so I was taking plenty of photos along the way. 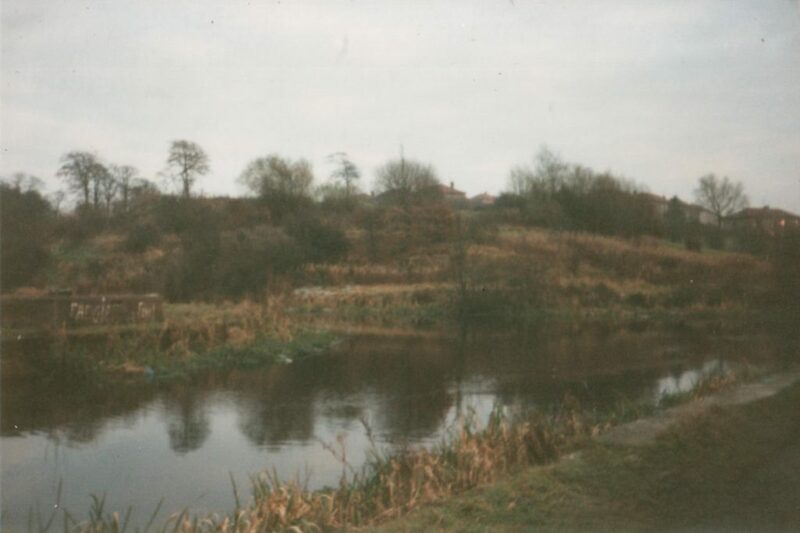 It wasn’t the best camera and I wasn’t the best photographer, but it’s still interesting to look back at what the canal was like in those days, as it’s changed quite a lot since then. So I’ve scanned the whole lot. When Saturday 20th dawned, I was glad to see that it was perfect weather for walking – cold but clear, with no rain and little wind. Ian and Chris (and Ben, their very excitable black labrador, who was also coming with us) picked me up first thing in the morning and Ian drove us all through to Bowling on the Clyde, via the M8 and the Erskine Bridge. On the way through I looked with interest at the map they’d brought, trying to work out the route we were going to be walking. I liked maps and already had quite a few of my own, but I didn’t have that one yet. At Bowling we parked in the station car park (an ideal location as we planned to get the train back to Bowling at the end of the day) and found the canal quite easily. 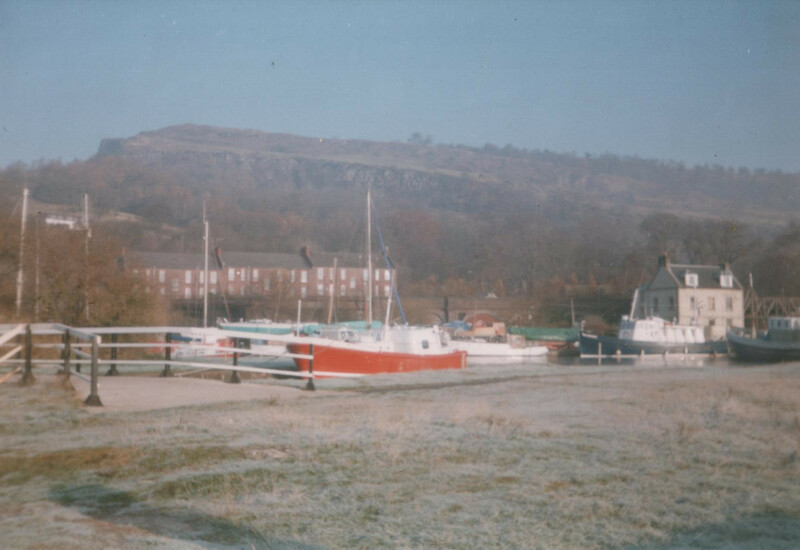 Although most of the canal had been closed for 30 years, the first part was still open so that boats from the Clyde could moor there, and there were lots of them in the terminal basin by the sea lock. The towpath that we would be following for the next 12 miles led invitingly off under a large disused railway bridge at the east end of the basin and, after I’d taken my first photo of the day, we were off! Now that we’d actually started, the walk somehow felt even longer. Even the Erskine Bridge, which passed over the canal a mile or so ahead of us, looked a long way away to me now. 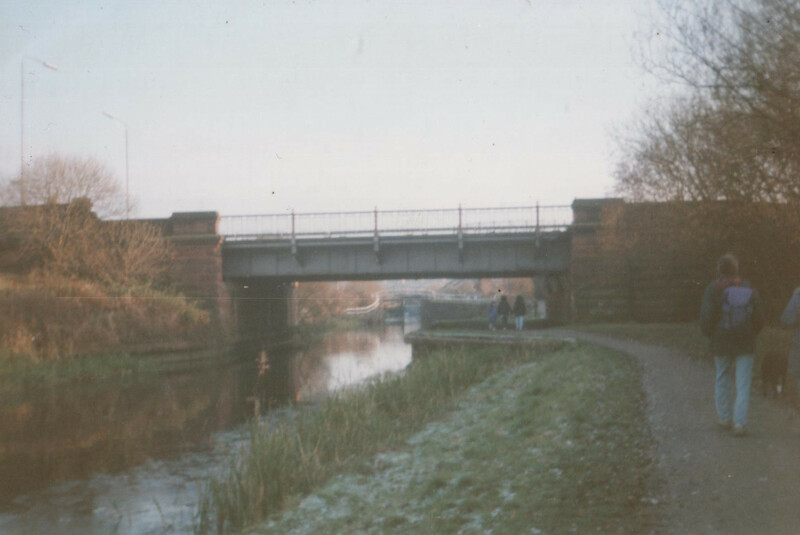 The canal was very different to the one I was used to; unlike the Union Canal it was built to take sea going ships, so it was much wider, and the bridges were lift or swing bridges rather than stone arches. 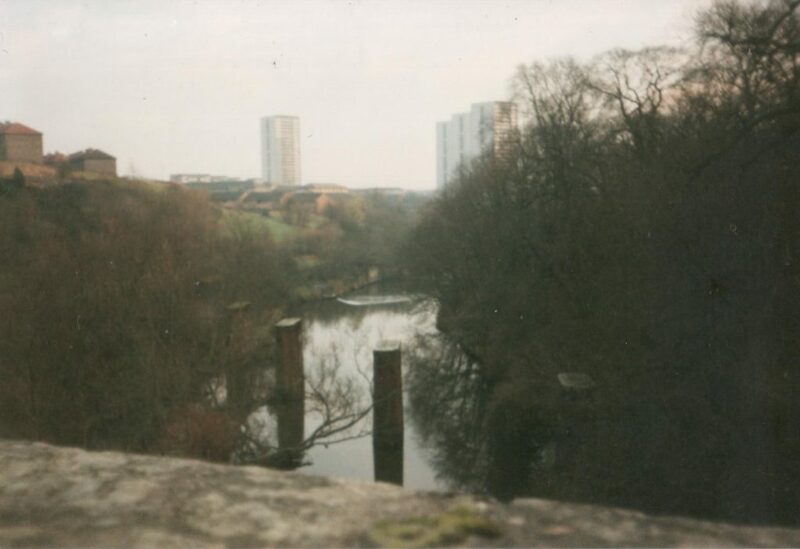 The first couple of miles of our walk had a pleasantly open and rural feel, the canal threading its way along the bank of the River Clyde next to a nature reserve and an overgrown disused railway line. 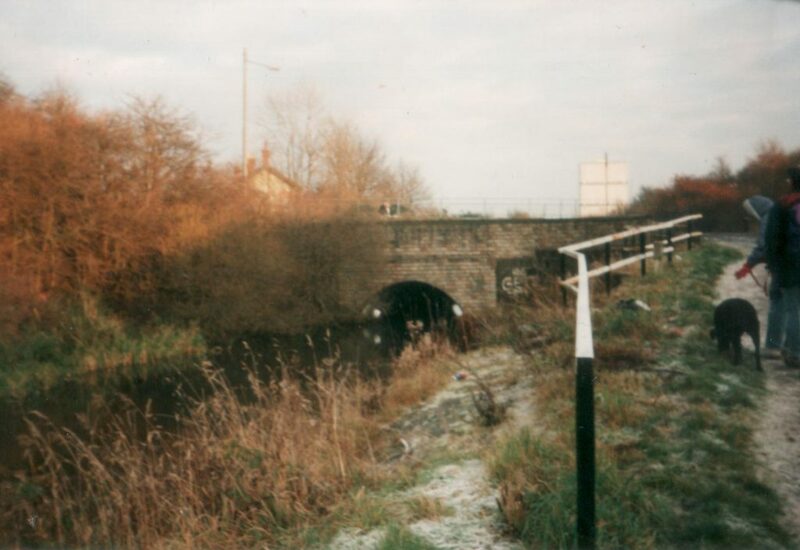 The character of the canal changed completely at Dalmuir, where it swung away from the river and was promptly blocked by the very busy Dumbarton Road. I didn’t know then that within a few short years the canal would be reopened, with Britain’s only “drop lock” installed here to take boats underneath the low road. At the time I was just glad to see that there was a pedestrian crossing to help us cross the busy road and get back onto the towpath again. The rural feel had gone completely and there were now houses on both sides. By this time we were starting to get hungry, probably due to a combination of the cold and the exercise. Chris had originally suggested we have lunch at the Lock 27 pub, but that was still miles away. Thankfully the huge Clyde Shopping Centre was just beyond the next road crossing, so we left the canal there to go and find something to eat. (Chris had told me before the walk that the canal went underneath a shopping centre at one point and I’d been looking forward to seeing that, but when we got there I found the reality of it a little disappointing. I’d pictured a huge building soaring high over the canal, with shoppers peering down at us from elevated walkways as we walked along beside it. 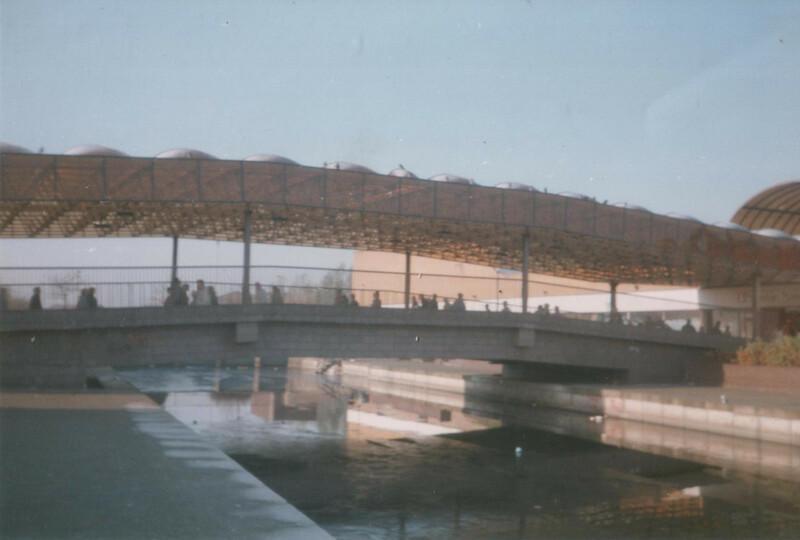 In reality it was really just a covered footbridge across the canal, linking the two parts of the shopping centre on either side. But there was a cafe that served bacon and chips and I wasn’t complaining about that). I wolfed down my lunch pretty quickly, then drew a rough map of what we’d walked so far while I waited for Ian and Chris to finish their coffee. I was enjoying myself immensely so far, and I knew that the longer and more interesting part of the walk was still to come – I couldn’t wait to get back to it! Once we’d retrieved Ben from where Chris had tied him up (someone had been feeding him dog biscuits but he obviously hadn’t liked the pink ones, which were still lying intact among the crumbs of the other colours), we returned to the towpath and to our walk. As we left the shopping centre behind I wondered what the huge “boat” was sitting on the far side of the canal – I later found out that it was a fish and chip shop! The next section of canal through Clydebank mostly flowed through quite an open, green area – it was nicer than what I’d expected from Clydebank, at any rate! Some of the original little wooden lifting “bascule” bridges were still there, but the newer roads mostly just crossed on embankments, the water channelled into pipes or weirs underneath – there was no chance of getting a boat through this section any time soon. There were also quite a few locks, which I found interesting as I hadn’t seen many locks before, the Union Canal not having any, so I lagged behind with Ben and had a closer look at them while Ian and Chris walked on. The old wooden gates mostly looked in a pretty bad state, and had been cut down to the minimum size needed to hold back the water now that the canal was no longer in use. 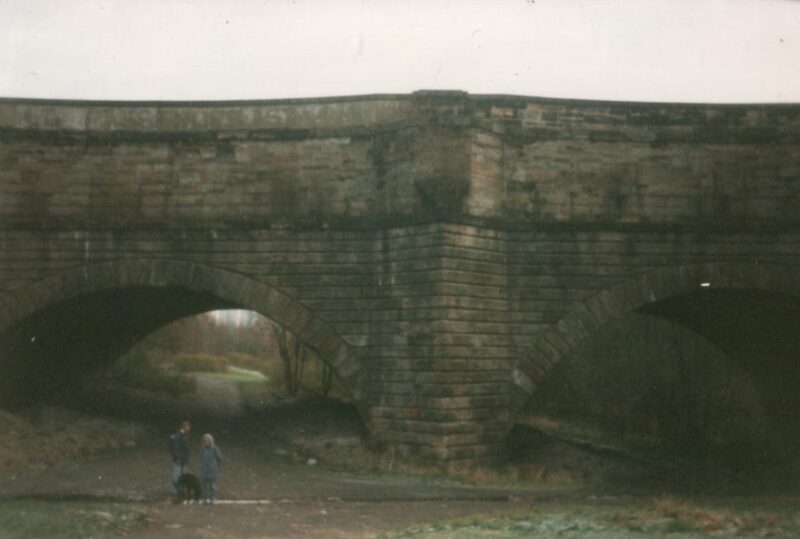 At one point we had to climb up an embankment and cross a busy dual carriageway, Great Western Road. On the other side the canal was piped for about half a mile so we had a little canal-less walk through some trees and then up through two dry, half-buried lock chambers that had been made into a little park. Ian was amused by a heritage sign that had been put up by British Waterways or some similar organisation that said “Forth and Clyde Canal” with “in culvert” in very small letters underneath, because there was no sign of any canal! After the canal re-appeared, we passed a few more dilapidated locks, but at least these ones had water in them. 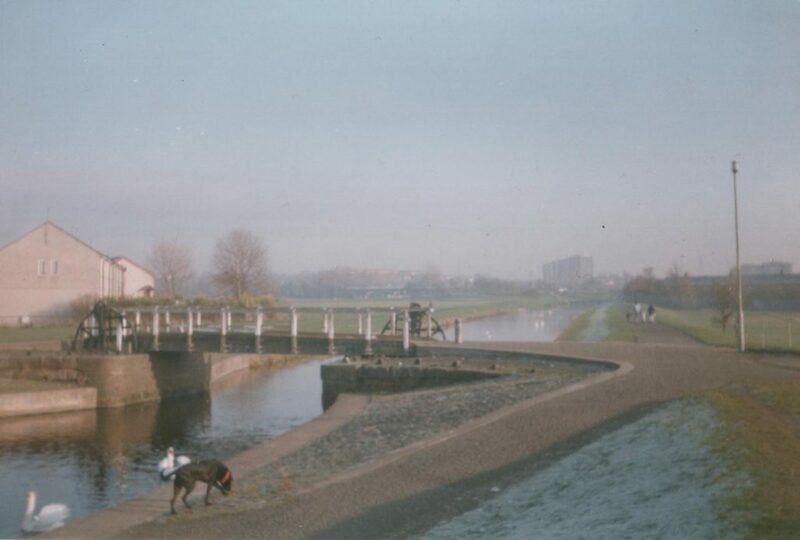 We were well into the suburbs of Glasgow now and the towpath was quite busy with local people walking their dogs or using the towpath as a shortcut. 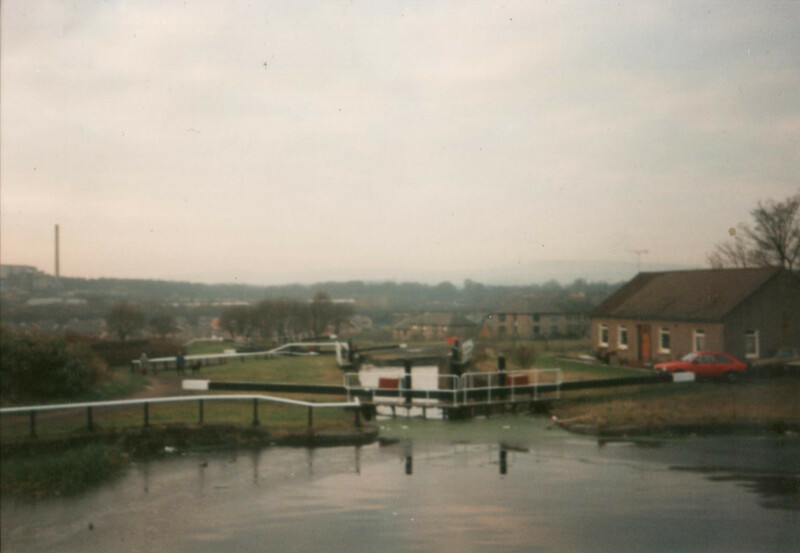 Lock 27, with its eponymous pub, was just past a huge metal lifting bridge carrying Bearsden Road at Temple. I think it was about 3pm by the time we got here, so I was glad we hadn’t waited this long to have lunch! We stopped for a little rest on a convenient bench and I loaded a new film into my camera, having finished the previous one. I was surprised to see that the next bridge looked from a distance as if it was arched, though too low for anything bigger than a canoe to get under it. As we got closer it turned out to actually be a modern corrugated iron culvert, so again we had a road to cross (you can see Chris putting Ben’s lead on ready for the road in the photo above). Now we were nearly at the part of the walk I’d been looking forward to the most: the Kelvin Aqueduct! After walking across the top and admiring the views down the river valley, we went down underneath it so I could take some photos of it from below. It wasn’t as long or as tall as the Union Canal’s three aqueducts, but it was impressively huge and solid. (I think it was actually easier to get decent photos of it back then that it is now – there were fewer trees in the way!). I also took a photo of the view from the top. I remember noticing the bridge piers a little way downstream and wondering what they were for. Little did I know they used to carry a railway line into the Kelvindale Tunnel, which I would explore nearly 19 years later. Just beyond the aqueduct was the final lock flight of our day. It was also the steepest climb of the day since there were 5 locks in quick succession here. They were a bit different from the other ones I saw that day since they’d recently been restored to working order, with new metal gates and smart black and white paint. (They also might look familiar to Still Game fans!). It was starting to get dark by this time, but I’d still been hoping to take a few more photos. 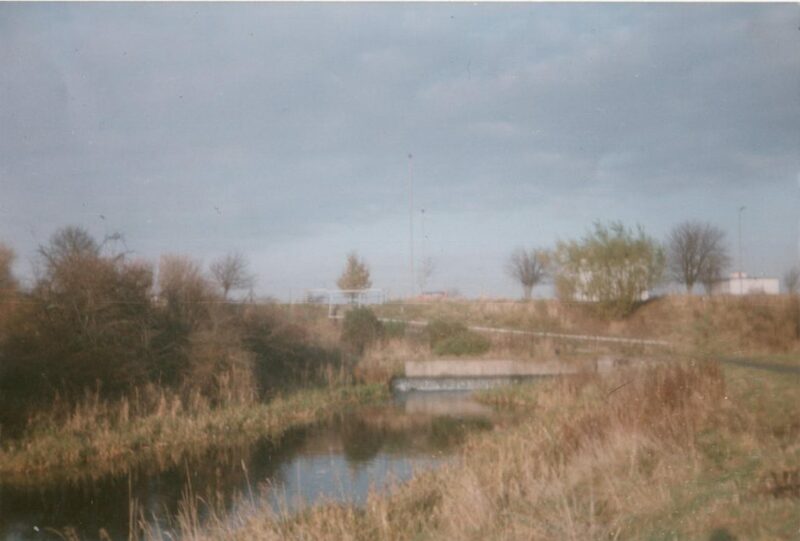 Imagine my annoyance when my camera decided the film was finished and it was going to rewind it, after I’d taken this picture of Stockingfield Junction (where a 2 mile branch into Glasgow city centre meets the main canal). I’d just put in what was supposed to be a 24 exposure film and I’d only got 9 photos out of it. I was hoping it was just a freak film but it turned out to be a recurring problem with that camera. Anyway, after we’d finished discussing the annoying behaviour of my camera, we turned our attention to the rest of the walk. Ian said that if I was tired we could leave the canal here and get the bus the rest of the way to the station, but I was still feeling fine and was happy to carry on walking. (As luck would have it, I then did start to feel really tired a few hundred yards further on, but I didn’t like to say anything at that point!). The Glasgow branch turned out to be pretty interesting. There were no more locks, but there were a couple of bridges which had been rebuilt in a modern concrete Charles Rennie Mackintosh-inspired style in order to reopen this section of the canal. (Previously they’d been low bridges or culverts that would have been impossible to sail under). There were also several aqueducts over roads, as this part of the canal was high up on an embankment above the surrounding city. We passed the Partick Thistle football stadium at Firhill. There was a match on, and some people were sitting up on the embankment so that they could see the pitch. Ian wanted to stay and watch the game but Chris and I, who had no interest in football, wouldn’t let him. We also passed a basin filled with colourful boats, the first boats we’d actually seen since Bowling (other than the fish and chip boat at Clydebank). It was now starting to get properly dark. Finally, we rounded a corner and at the end of a cobbled wharf was… the end of the canal! It was weird to see it suddenly just stop after following it all day. We stood there a while getting our breath back and looking out over the lights of the city below us. We’d made it. Now it was time for the next challenge: finding Queen Street Station so that we could catch a train back to Bowling where we’d left the car. Fortunately this was easy enough, and soon we were sitting on one of the low level platforms waiting for the train and eating what was left of the food we’d brought. (After that night I had quite a vivid memory of the low level platforms at Queen Street, though I hadn’t realised there was also a high level station, so I was quite perplexed when I got the train through from Edinburgh the following year and the station looked nothing like I remembered. It was years before I finally found myself in the low level part again and thought “Yes! This is the place I remember!”). When the train came, it only took a few minutes to cover the distance it had taken us all day to walk. It had been a great day out and had more than lived up to my expectations, as evidenced by the fact I still remember it so well 25 years later! It ended up being the first of three walks, as I ended up walking the whole canal with Ian and Chris between 1993 and 1995. The other two walks were just as enjoyable so maybe I’ll write about them as well when their 25 year anniversaries come around… but for now, thanks for reading 🙂 . In memory of Ian Ogilvy Morrison, 1950-2006. This entry was posted in Walking by gcat. Bookmark the permalink.